The OBX Restaurant Guide will help you discover exceptional Outer Banks Restaurants. Explore different cuisines and locations for any meal. Any time of day there’s an OBX restaurant for you. 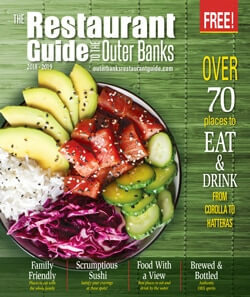 Corolla Restaurants, Duck Restaurants, Kitty Hawk Restaurants, Kill Devil Hills Restaurants, Nags Head Restaurants, and Hatteras Island Restaurants are all found in the Outer Banks Restaurant Guide. The immense variety of menu options along with our unique ocean-centric location is what sets the Outer Banks apart from other vacation destinations, and our guide will help you discover the best dining destination for you and your party. Whether it is fine dining, taking the whole family out for pizza and burgers, or something in between – dining in Outer Banks Restaurants takes on a whole new feel for everyone. With a vast variety of seafood available right in our own backyard, dining out at many Outer Banks restaurants should be considered essential to your vacation experience. Here on our barrier islands, we have “fresh off the dock” seafood available on a near-daily basis. From blue crabs to oysters to any variation of fish, you can find it in an Outer Banks restaurant. For the non-seafood lovers, there are plenty of exciting menu options ranging from simple pleasures — like North Carolina barbeque and home cooking — to more imaginative cuisine and an array of ethnic eateries. Whether you’re craving Asian, Italian, Mexican, or something with a Caribbean flare, there is sure to be something to please your palate. As for atmosphere, you won’t find it better than on the Outer Banks. Many restaurants feature panoramic water views and outdoor decking to enjoy a notorious OBX sunset. Whatever your preferences, budget, or group size, the Outer Banks has restaurant choices from Corolla to Hatteras Island to satisfy your cravings. There is always something for both the epicurean and the casual diner. Sound side, oceanfront, kid-friendly, fine dining, or a combination, the Outer Banks has it, and the information you need to discover the best restaurants on the beach is in the Outer Banks Restaurant Guide. Take Out - OBX Restaurants that offer take out meals. Enjoy delicious North Carolina fare in the comfort of your own vacation home, on the beach or on the go. Try these great local restaurants for the best take out on the beach. It’s no surprise that after 40 years, Miller’s Seafood & Steakhouse still feels like a place to come home to each and every time you walk through the doors and relax in their dining room infused with Outer Banks charm.